I love to read. Always have. But I don’t read books in a conventional format as much as I’d like to these days (wonder why? hmm…). Over the last several years, though, I’ve plowed through my fair share of Audible books, and most days, I spend at least 30 minutes reading aloud to the kids. And I’m a huge sucker for books that are both engaging and beautiful. So, below you’ll find a (rather random) compilation of books that we own, books that I’ve listened to, and books that I’m buying for my children this Christmas. It’s certainly no exhaustive list, but I hope that it helps you find some new books you love for your family or loved ones. First up, I thought I’d share some of the informative + pretty books that I’ve bought for the kids over the past several years. (Note: any of these books that deal with nature write from an evolutionist’s perspective, and while we learn from a creation point of view, I just use the evolutionary parts as teaching moments). The younger kids and I have been reading through this fascinating and adorably illustrated book about bees, and I’m learning just as much as they are. The whole “ium” series is so well-done and beautifully illustrated! …then Botanicum (both of which we have). Maps might not sound that enticing, but it includes so much more than topographical info, and as with all of these titles, the illustrations are fabulous. 50 states is such a fun and well-drawn look at some of the best quirks/interesting facts/info about–you guessed it–the 50 United States of America. I bought all three of these Julia Rothman gems separately, but you can now buy them as a set! Not too surprisingly, Theo is a big fan of the Big Book of Bugs. We don’t own the the Big Book of Beasts or the Big Book of Blue yet, but they’re going on my list. Wonder Garden is just gorgeous. The end. Atlas of Adventures is a fun, colorful read that kids of all ages enjoy. If you scroll down underneath Atlas of Adventures, you’ll see a lot more “Atlases” about various topics. Again, scroll below the listing to see all of its counterparts. And this series is new to me, but I’m thinking my kiddos would love it! and then Over and Under the Pond and Up in the Garden and Down in the Dirt. What library is complete without the Madeline treasury–all in one beautiful, hardback book? Or the complete Chronicles of Narnia? …and Book 2 and Book 3. I just ordered the complete Little House on the Prairie series for reading aloud (although, I’ve heard great things about the Audible version), but I strongly suspect that if Della, who is quite the little book worm, gets a hold of them, I’ll have a hard time prying them out of her cute little fingers. This is another series that I just ordered for the younger kids. It’s supposed to whimsical, wry, and highly entertaining. I also just ordered the Wingfeather saga for Ezra and Simon, who get really excited about books full of adventure and mystery. It’s written by Andrew Peterson (yep, the Christian singer). The first book in the series is On the Edge of the Dark Sea of Darkness. Scroll down under this listing for all of the rest of the books in the series. And the 100 Cupboards series is another favorite for the boys. The first book is 100 Cupboards. …and you can scroll below it for the rest of the books. And now for adult books. My favorite non-fiction book of 2018 was Educated. It’s a bit of a mind-boggling but engrossing read. I also loved The Read-Aloud Family (which is where I discovered The Green Ember series, by the way). I really appreciate Sarah Mackenzie’s writing style (so warm, personable, and witty) and her encouragement that the simple act of reading aloud to your children can forge bonds that will stand the test of time and teenage angst. My friend, Jennifer, recommended Love Does to me, and, while I haven’t read it yet, I’m excited to do so. So much so that I ordered Love Does for Kids too! Chances are, if I’m listening to a book on Audible, it’s a novel about World War II. What can I say? I’m a sucker for historical fiction, and one of the most fascinating (and horrifying) periods is WWII. Beneath a Scarlet Sky is a work of fiction based on a real man’s life, and I listened to all 17 or so hours of it while wallpapering our dining room last winter. It definitely made a tedious task considerably more bearable (even if it does start out a little stronger than it ends). And The Baker’s Secret just might be my favorite WWII novel of all time (although, it would be a close shave with Code Name Verity…which…I love for the superb narration almost as much as the captivating story). The Ragged Edge of Night is another absorbing, based-on-real-life events WWII novel about a friar turned mail-order husband turned Nazi resister. I Was Anastasia is not about WWII (the Anastasia in question bears the last name Romonav, if that clues you in), but it’s no less interesting a read, especially since it’s written in a mind-bending, end-to-the-beginning order that forces you to pay attention to the details lest you lose your place in the two overlapping narratives. As for cookbooks, I’m not great about using them, but I (along with innumerable others) recently acquired Magnolia Table and am loving how accessible most of the recipes are. The next two might not be as accessible (because they’re both vegetarian), but the pictures are divine, and I love the emphasis on fresh ingredients. The Love and Lemons Cookbook is truly one of the most visually appealing ever, and, if the reviews are any indication, chock full of tastiness. And the Forest Feast Gatherings book are both stuffed full of unique twists on traditionally meat-filled recipes, not to mention beautiful photography. When it comes to decorating, I don’t “do” high-end. I’m a bargain-hunting, Goodwill-loving, collected-over-time girl down to the depths of my soul. Which is why I love the following books for accessible, eclectic design inspo. I don’t have this one yet, but it looks really fun! I could keep going (and going), but I’d have to stop at some point, so this is as good a one as any. Hope you find something that tickles your fancy (and your brain!). If you’re still stuck for gifts, be sure to scroll back through my last 4 posts. There’s a whole lot of Amazon Prime options at your fingerprints that will make it in plenty of time for Christmas! 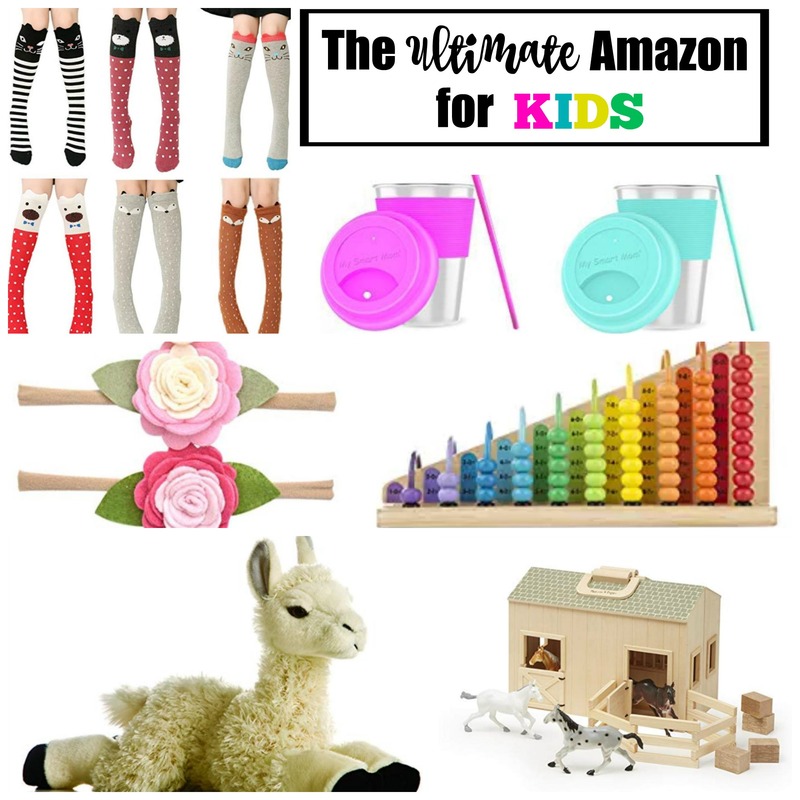 Around our house, we typically stick with the Something You Want, Something You Need, Something to Wear, Something to Read philosophy when it comes to kid gifts. 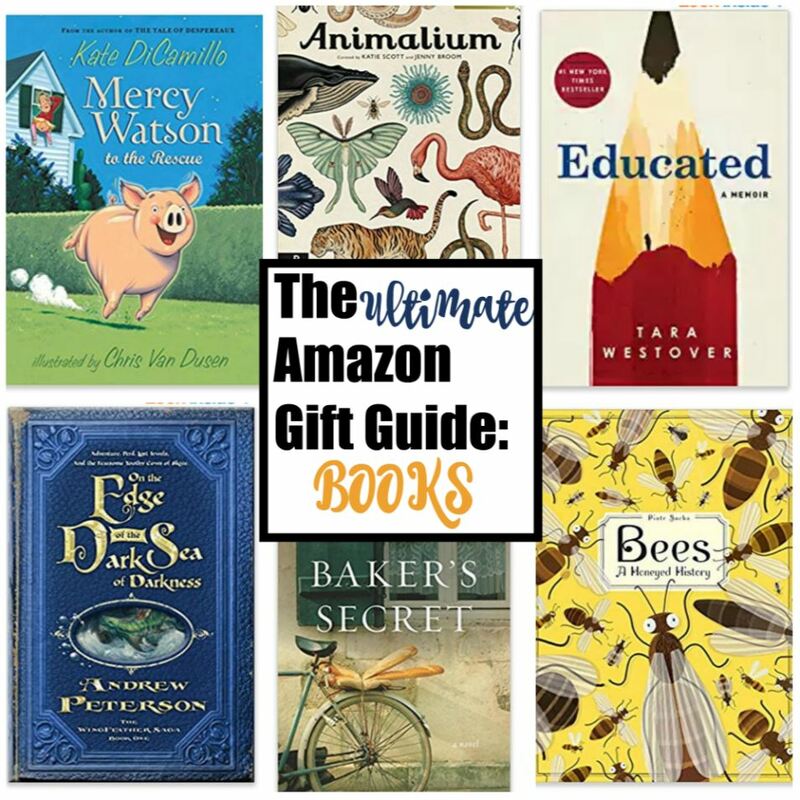 The focus is definitely on the “read” (I use it as an opportunity to buy lots of fun books for homeschooling or read-aloud) and one really fun “want” (the “wear” and the “need” are pretty minimal). Regardless of your gift-giving philosophy, chances are, you’ve still got a kiddo–whether your own or someone else’s–left to buy for. So, I’ve rounded up some Amazon options for your viewing pleasure. Hopefully, at least one of them fills a “necessary” gap. It’s hard to go wrong with crafty presents, and this translucent colored glue would make a great addition to anyone’s art caddy. And then there’s this Little Experimenter Globe. It lights up and has a petite size (8″) for little hands. This Crafty Connect building set is a fun, educational alternative to Legos. Cheaper too (per size of the plastic, anyway). (P.S. Theo just saw the picture of these and said, “Mama, I wish I could have some of those.” Okay, kiddo). We have this fun, colorful adding abacus, and, while the twins are a bit old for it, Theo loves playing with it at this point, and I can see its being a really useful tool when I start teaching him more formally. A friend turned me onto Yeti in My Spaghetti a few weeks back, and I love how simple, multiple-age friendly/entertaining it is. I mean, what little girl wouldn’t squeal with delight upon receiving DISNEY! PRINCESS! NAIL! POLISH! My mom has one of these, and my kids love to pile on it with their cousins and swing, swing, swing! Okay, so, depending on your kids’ age, this gift would be nothing short of a punishment for yourself. But if you’ve got an art-inclined older kid in your life, this is a really good deal on this many colored Sharpies. Sometimes, I think my 8-year-old could use these, but presumably, if you’ve got a baby girl in your life to buy for, her mama would be pretty thrilled with the high level of practicality + cuteness. Is there a child in the world that doesn’t love bubbles? And making messes? Combine the two with this bubble formula kit that’s fun, educational, and (because it’s soap) fairly easy to clean up after. Speaking of clean, what could be more fun than filling your tub with swirly, colorful suds? Most of my kids take showers at this point, but I can still remember the days when my kids’ taking a bath felt like a major break from mothering to me. And these bath bombs would surely have prolonged the fun in the tub. For them and for me. These magnetic blocks are intriguing. A little pricier than the conventional variety. But also cooler. We bought the twins a calico critter house + some of the critters themselves for their 6th birthday, and they have played with them pretty much every day since. I remember doing the same for hours with my little animal house/sets when I was little. It’s a pretty universally appealing thing for little kids, apparently. This is what I got Theo for Christmas this year. Of course, I managed to score it at Dirt Cheap for $3 (can you BELIEVE that?? ), which probably immediately makes the Amazon price tag feel downright usurious. But I can personally attest to how cute and well-made it is, so if you have someone who would love it and just want to get ‘ur done, Amazon is probably your best bet. This is another one we have at home. Theo was waking up WAY too early about 6 months ago, so we got this puppy clock (which has the ability to set various alarms and shows a green light when it’s okay to get up and red when it’s not) to help curb his tendency to ask for breakfast while it was still dark. And it totally worked! I’m a bit torn on even recommending this particular item, since I’m not much of a technology girl when it comes to my kids (or myself in many ways) and think that the last thing most kids need is one more distraction from real life. Even so, this one has great reviews for fun features like interactive educational games + a pedometer + lots of other bells and whistles. I wouldn’t give it to a small child, but it would make a fun gift for a responsible tween. Plus, it has parental settings to limit your child’s usage time. There’s nothing cheap about this American Girl Welliewishers except that it is cheapER (and also smaller) than the traditional dolls. Maybe a good grandparent gift for a younger girl who isn’t ready for the responsibility of the full-sized dolls? These socks are just too fun to pass up. I’m ordering some for the girls stockings and am already picturing their trying to wear them with, well, everything. We have two sets of these stainless steel + silicone cups. My kids love the bright colors and that each of them has his or her own. I love that the silicone is free of all of the chemicals found in plastic. I know, I know. A slingshot? What, do you want them to do? Put out an eye?? Read on, dear friends. It’d be awfully hard to put out an eye with felt balls as ammo. But still fun to use them for target practice. Just saying. Love the simplicity of this teepee. I also think it would be fun to add colorful bunting or other fun details to. Not that any but the most organized kid would get too excited about these, but I can sure think of a whole lot of mamas who would be happy to receive a set of cutie-pie storage bins for their child’s room. This one is another stocking stuffer I’m considering for my girls. They have definitely been known to accessorize their “play clothes” with a well-coordinated (or not) bow. Isn’t this llama just the fluffiest thing? I love that it’s kid-friendly without being over-the-top cutesy. We have this giant jenga set and have been enjoying epic (and epically loud when it falls) rounds of it. Pretty much all of the kids can at least sort of participate, and the older kids can stretch it for a good while. This is a nice counterpart to the fold and go horse barn above and would make a great little set for a girl with a love of dolls but not tons of space to store them. Della bought this Fairy Garden (which was considerably more expensive at the time) with her own money a while back and had great fun with it…until she over-watered it, and her tiny green shoots succumbed to mildew. If you’re giving it as a gift to someone other than your own child, that won’t be your problem to monitor. But if you are considering it for your own daughters, a word to the wise: a little water goes a long way. Did anything strike your fancy? If so, you’d best hop on it (although, I did try to make sure that each of them came with Prime shipping). I’ll be back soon with a book list for the true procrastinators among us (myself included; I’ve got everything but my book order placed).